Recently launched Mahindra Marazzo MPV gets a strong four-star crash test rating. 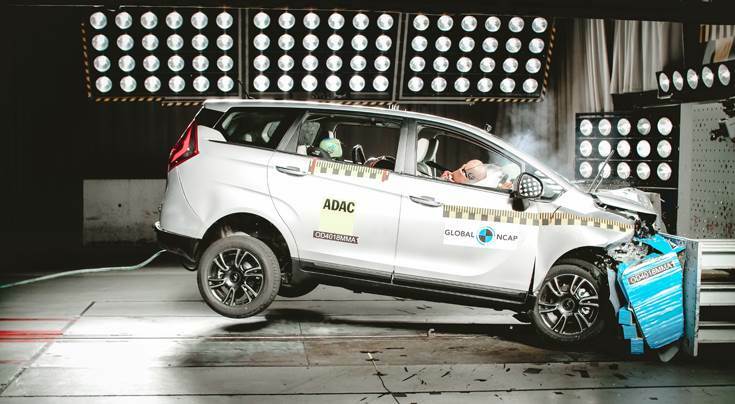 Exactly four months after the Tata Nexon received a four-star Global NCAP crash safety rating, the compact SUV has done even better. It has become the first made-in-India, sold-in-India car to achieve Global NCAP’s coveted five-star crash test rating. 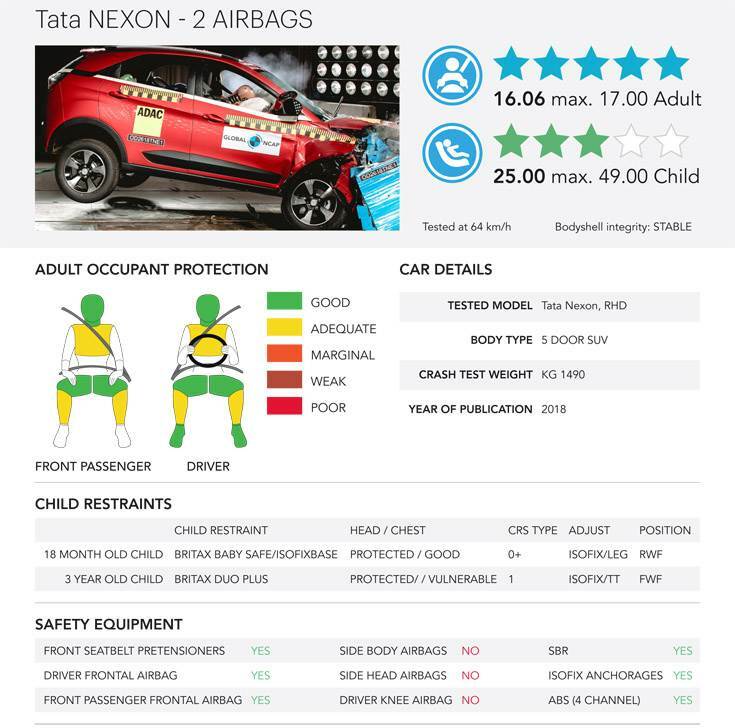 The Tata Nexon scored five stars for Adult Occupant Protection and three stars for Child Occupant Protection. Following the Nexon’s four-star result earlier this year, Tata Motors has improved a number of safety features including making a Seat Belt Reminder (SBR) for driver and passenger a standard for all variants of the model. In addition the Nexon was required to pass a side impact test meeting UN95 side impact protection requirements. Tested for both front and side impact, the Nexon’s structural integrity and overall safety has been evaluated in the Global NCAP crash test. The combined evaluation of both tests has resulted in a full five-star rating, the highest adult occupant safety score of (16.06/17.00) amongst all the models tested in the Indian market. The Nexon has also achieved a three-star rating for child occupant safety. Speaking on the results, Mayank Pareek, president – PVBU, Tata Motors, said, “Indian car buyers are increasingly rating safety as one of the topmost parameters while making a car purchase. We are elated to receive the highest ever safety rating from Global NCAP for the Nexon. With these test results, the Nexon becomes the first car in the country to achieve a full five-star adult safety rating and emerges as India’s safest car in terms of crash safety”. Meanwhile, the recently launched Mahindra Marazzo MPV has also done well, achieving a four-star result. 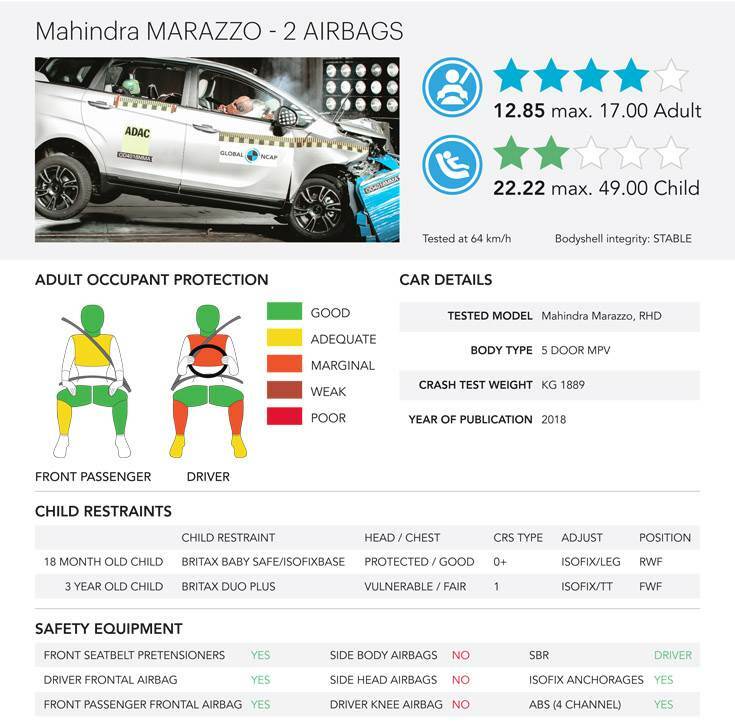 The Marazzo with standard double airbags, ABS, SBR for driver and ISOFIX anchorages, reached four stars in Adult Occupant Protection and two stars for Child Occupant Protection. Commenting on the result, Rajan Wadhera, president - Automotive Sector, Mahindra & Mahindra, said, “This is a proud moment for Mahindra as the 4-star rating for Adult Occupation Protection reiterates our commitment towards safety. We have designed the Marazzo with many new safety features to ensure a safe ride for our customers. With Safety being at the forefront for all our vehicles, I am sure that this recognition will spur us to achieve higher safety parameters for our entire range of vehicles”.